On Thursday, Drake dropped the video for his single “I’m Upset,” and it’s a literal Degrassi: The Next Generation class reunion. The nostalgia factor alone is enough for everyone to forget that we were mad about Drake being an alleged deadbeat dad a week ago. Genius marketing. During his tenure on the cult Canadian teen drama, Drake—then known simply as Aubrey Graham—played Jimmy Brooks, a popular basketball player who became paralyzed from the waist down after a school shooting in the show’s fourth season. He and his classmates went through it all: coming out, getting gonorrhea, discovering bedazzled thongs, becoming teen pregnant...you know, the usual melodramatic teen fare. 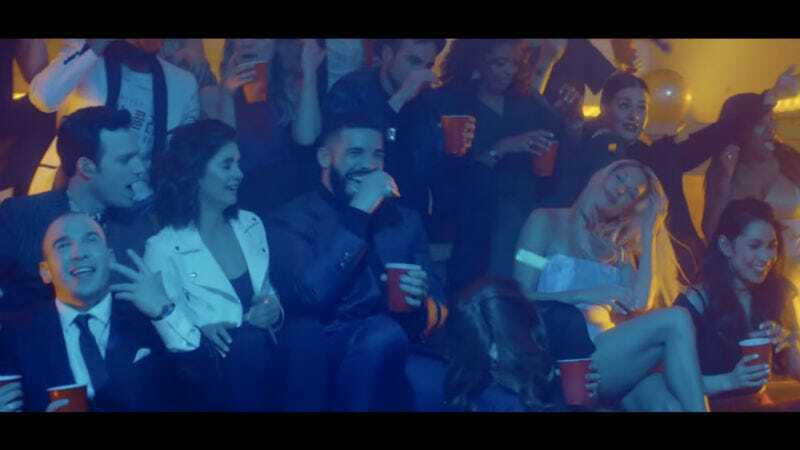 In the video, Drake (or Jimmy) gets dolled up for his high school reunion and meets up with Shane Kippel, who played Jimmy’s best friend, Spinner. Lauren Collins (Paige), Stacey Farber (Ellie), Adamo Ruggiero (Marco), Jake Epstein (Craig), Andrea Lewis (Hazel), Christina Schmidt (Terri), Melissa McIntyre (Ashley), LinLyn Lue (Ms. Kwan), Stefan Brogren (Snake/Mr. Simpson), Ephraim Ellis (Rick, back from the dead), Jake Goldsbie (Toby), Marc Donato (Derek), Dalmar Abuzeid (Danny), A.J. Saudin (Connor), Cassie Steele (Manny), Miriam McDonald (Emma), Nina Dobrev (Mia), Sarah Barrable-Tishauer (Liberty), and Paula Brancati (Jane). Jay and Silent Bob also make appearances, continuing their peculiar relationship with the Degrassi franchise. Notably absent was Ryan Cooley, who played J.T. Yorke, but we’ll live I guess. The main takeaway from this video—Drake’s third video directed by Karena Evans—is that the entire cast is smoking hot now. Maybe there’s something in the Canadian water, but folks, I’m shook. Come along with me on a journey of thirst. Ride or dies. Also, shouts to Drake’s sleek turtleneck look. Emma and Manny have been through so much. Am I crying? Paige Michaelchuk, the queen bee to end all queen bees. Terri is damn near unrecognizable and absolutely gorgeous, and Hazel is a goddess as usual. Ellie, the Hot Topic Punk Princess, has arrive. Jimmy Brooks still got shooters, Rick. Emma isn’t wasting a moment of this opportunity to be a video vixen. YES. WE STAN AN ANNOYING, JUDGMENTAL, ENVIRONMENTALLY AWARE QUEEN WHO DID NOT LET GONORRHEA GET HER DOWN. Craig (no longer on coke) and Ashley (no longer goth). Liberty with the smoulder. I see you, green jumpsuit. Her glow up is inspiring. Nina Dobrev is happy to be here! I definitely wasn’t watching anymore by the time Connor was a relevant character, but the man who plays him (A.J. Saudin) is getting an Instagram follow this instant. Oh, and here’s Nina Dobrev with her heel stuck in a child’s tricycle. Whew! Thanks, Drake. Now go take care of your alleged kid.